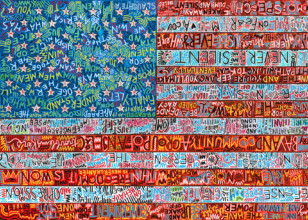 On President’s Day 2017, the partnership of artist Tennessee Loveless and his representing agency Combemale Creative, through ArtInsights Gallery of Film and Contemporary Art announced a new collection of American flag-inspired art called “Vox Populi“. They are premiering the first piece, “PoMo Patriots”, which is the start of a larger examination of how the voting population, though deeply divided, must come together. A nation that chooses understanding, critical thinking, and lessons from history, can change their perspective to move beyond, and rise above those in power who seek to mine those divisions for their own greed and personal gain. 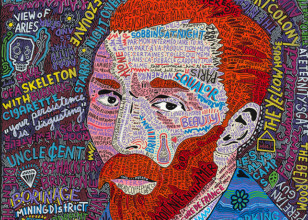 In the first image, Loveless chose quotes from a variety of politicians, activists, and philosophers, who come from very different perspectives and represent the spectrum of political thought. These quotes speak of freedom, patriotism, and the importance of standing up for justice when necessary. From George Washington to Harvey Milk, Eleanor Roosevelt and Bayard Rustin, to Lincoln, Tennessee creates an inspiring, moving statement about resistance. 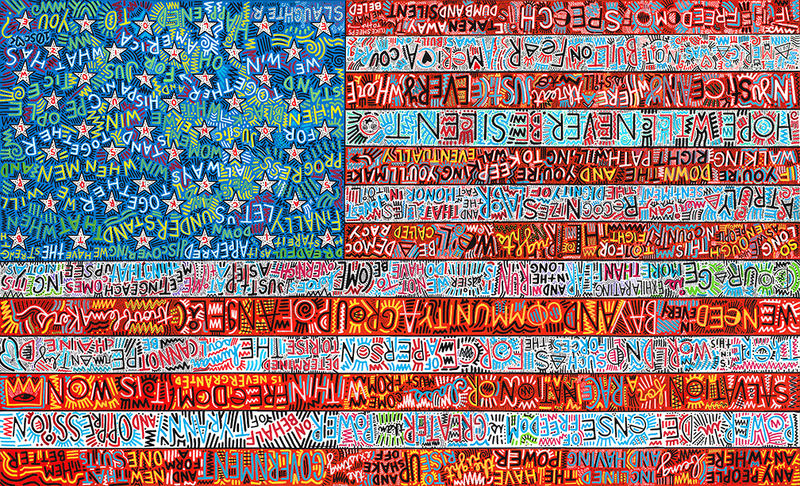 Written into the design of the American flag, the words are presented upside-down, requiring those who examine it to shift their perspective in order to read it. “PoMo Patriots” is the first of an American Flag series called “Vox Populi”, another element of which will include fifteen pieces set to articulate important voices, perspectives, and events that make up what it means to be American. They will make announcements as the art is released for viewing and sale. 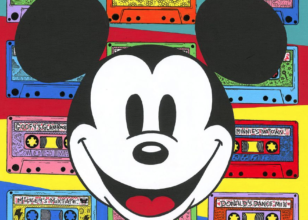 While this first original is sold, there are limited editions available in two versions. This deluxe version sized at 21 x 32 inches, signed and numbered, is an edition of only 10 for $795. Ready for immediate delivery. 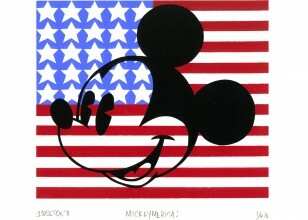 "I love America. I love my fellow Americans. I love my fellow Americans even if they hate me because I’m queer. I still love them. I love America so much I am willing to use whatever ability I have, to fight for people to be here. I love America so much that I am willing to create art as a mirror to show people, even though we were founded on a poisonous colonialist and ongoing imperialistic structure (which I dislike greatly and will continually fight against) that this ‘MELTING POT’ exists because of activism for ALL EQUAL RIGHTS. 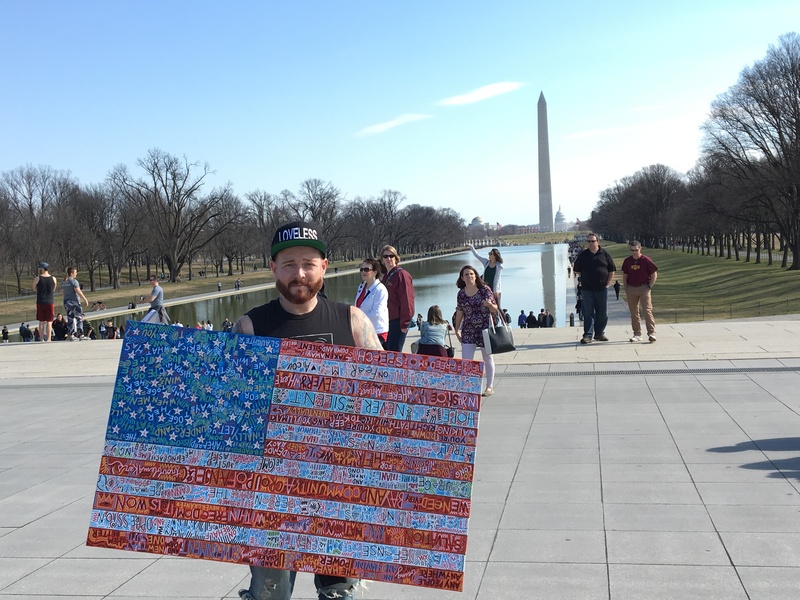 I love America so much, that I have used my blood, sweat, and tears to create a piece about a pattern I am ironically terrified of because of people confusing “patriotism” with “nationalism”. I love America so much that I used quotes of people who fought for inclusivity and equality like Malcolm X, Eleanor Roosevelt, Harvey Milk, Bayard Rustin and more… I love America so much that I turned their quotes upside down on the flag so that my fellow Americans had to contort themselves beyond the pattern to read what America was about. I love America so much that I flew to DC with this portrait and stood in front of every monument, INCLUDING THE WHITE HOUSE to talk about the state of our administration. I love America so much that I fought through my fellow American’s jeers, shade, and disdain for what I was doing.. and yet I was overwhelming met with hugs and tears. I love this country enough to know when it's absolutely backwards and fighting itself. I love America. and yet I am afraid of the thing I love. Regardless I will fight as an advocate with my cis white privilege .. because my weapon and shield is a brush and my voice."